A controversial memo alleging FBI investigators abused their powers in the probe of Russian interference in the 2016 presidential election is “embarrassingly flawed,” the ranking Democrat on the House Judiciary Committee said Saturday. House Judiciary Committee ranking member Rep. Jerrold Nadler, D-N.Y., arrives for a House Judiciary hearing on Capitol Hill in Washington, Dec. 7, 2017, on oversight of the Federal Bureau of Investigation. The memo, released to the public Friday, alleges that the FBI overstepped its authority in obtaining a surveillance warrant for an aide to Donald Trump’s presidential campaign. The Nunes memo says the FBI relied heavily on a dossier of information assembled by Christopher Steele, a Russia expert and former British spy, for the campaign of Trump rival Hillary Clinton, via the law firm Perkins Cole and the research firm Fusion GPS. 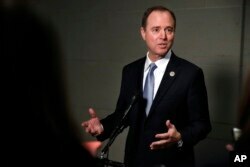 The release of the memo intensified the battle between Trump and his Republican allies in Congress on one side and Democrats and top FBI officials on the other about whether the probe into Russian interference in the presidential election was affected by political bias on the part of investigators. 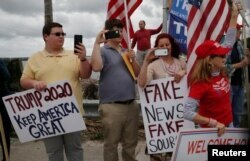 A man watches people cheer as U.S. President Donald Trump passes by in his motorcade on his way to his Mar-A-Lago club in Palm Beach, Florida, Feb. 3, 2018. Trump did not quote a later paragraph in the editorial, in which the Wall Street Journal called for the release of the Democratic rebuttal to the Nunes memo. “Democrats are howling that the memo, produced by Republican staff, is misleading and leaves out essential details,” the Journal said. “By all means let’s see that, too. President Trump should declassify it promptly.” The editorial also called for release of a referral for criminal investigation of the dossier’s author. Earlier in the day, Trump tweeted that the disputed Republican memo “totally vindicates” him, despite a contrary view by most Democrats. FILE - Rep. Adam Schiff, D-Calif., ranking member of the House Intelligence Committee, speaks to the media after attending a closed meeting with testimony by Attorney General Jeff Sessions, Nov. 30, 2017, on Capitol Hill in Washington. A significant part of the document focuses on Foreign Intelligence Surveillance Act (FISA) warrants that permitted FBI surveillance of former Trump campaign foreign policy adviser Carter Page, a businessman with interests in Russia. There had been concerns about Page’s alleged contacts with Russian intelligence agents. The memo asserts that the dossier was an “essential part” of the FISA application on Page. FILE - President Donald Trump sits with FBI Director Christopher Wray during the FBI National Academy graduation ceremony in Quantico, Va. The FBI noted it was given “limited opportunity” to review the document before lawmakers voted to release it. “As expressed during our initial review, we have grave concerns about material omissions of fact that fundamentally impact the memo’s accuracy,” the agency said. 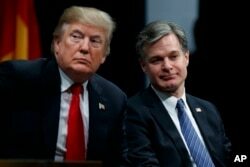 FBI Director Christopher Wray told agency employees Friday that he stood with them after the release of the memo. “I stand by our shared determination to do our work independently and by the book,” Wray said in a statement to 35,000 FBI staff members.